I'm an enormous fan of biographical picture books for children. With real life far stranger than fiction, it's a good, good thing to have even the youngest amongst us explore the lives of talented people who've contributed so much to the world. In this divinely illustrated book, we explore the world of poet EE Cummings. Edward Estlin Cummings was born in Massachusetts in 1894. He grew up in a house jammed with extended family and pets, making for a vibrant childhood. He was just three when he uttered his first poem, inspired by the birds outside his window. Through his childhood, the young lad wrote poetry voraciously, often inspired by his father and the happenings of his childhood. He had a penchant for inventing new words, or squishing them together--beanhamegg. Estlin loved to be alone. His father helped him craft a tree house where he'd spend time drawing and writing and popping popcorn on a little stove, peering at the world from his creative enclave, inspired to write about all that he saw. This theme of observing the world from a creative nook, continued on in his life. This is such a beautifully inspiring story that will send you straight to a sheet of blank paper, keen to create. 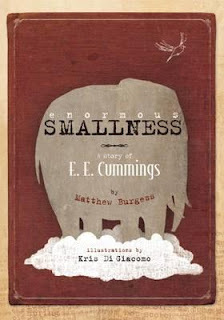 Gently told, it is accompanied by Kris di Giacomo's truly gorgeous illustrations, resplendent with charm and texture. The book also includes a timeline at the back of the book and an author's note, along with several EE Cummings poems. Beloved the world over, this man is absolutely someone all children should meet--if only in the pages of a book.